Bronze equestrian memorial to Revolutionary War general and commander of the Army of the South; commissioned by Congress, dedicated 1877; Henry Kirke Brown, sculptor. 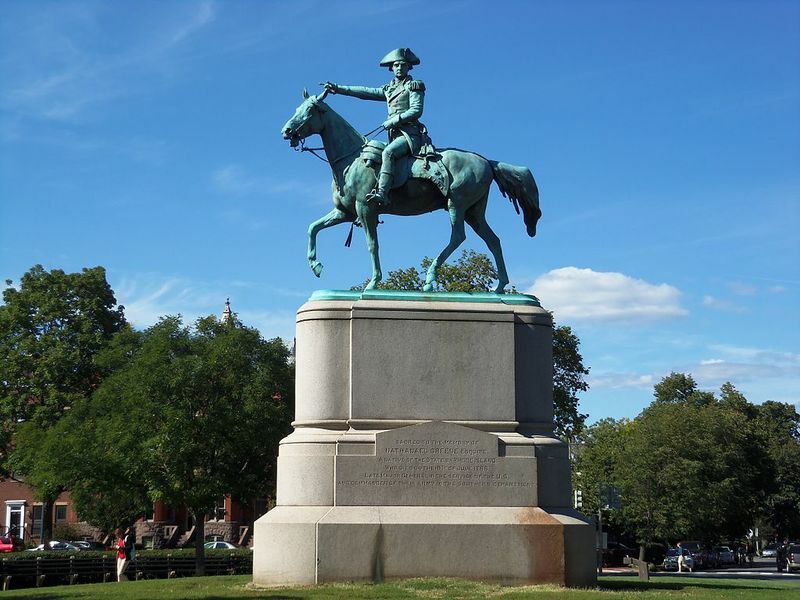 This bronze equestrian memorial to Major General Nathaniel Greene Revolutionary War general, was commissioned and paid for by. Congress,. The statue measures 13 feet in height and surmounts a 20 foot granite pedestal., Greene sits erect upon his horse holding the reins in his left hand.while turning his face directly out to the side. His right arm is extended straight before him, as if pointing to the enemy. The placement of Greene f s body directly in line with the horse gives the statue a strong quality of silhouette. Only the general's feet in the stirrups break the plane slightly. Great attention has been given to the details of his uniform. The granite pedestal is oblong in form with rounded ends. It is ornamented by moldings at each step and by the inscription panel on each side. Greene, a native of Rhode Island, succeeded General Gates as Commander of the Army of the South and drove the British forces from Georgia and the Carolinas in 1782. The statue was erected by the government under an Act approved June 23, 1874 (18 Stat. 209) at a cost of $50,000 including pedestal. It was dedicated in 1877. 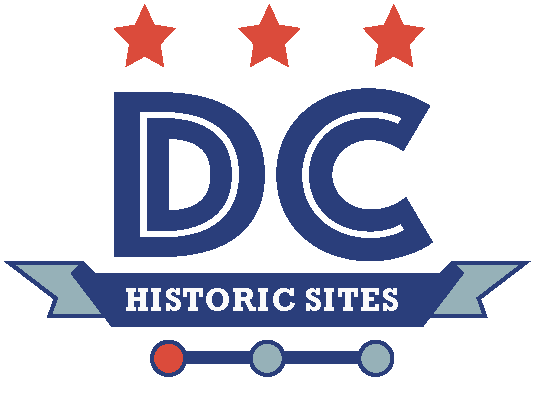 It is located in Stanton Park at 5th and C St.,N.E., Reservation 15. 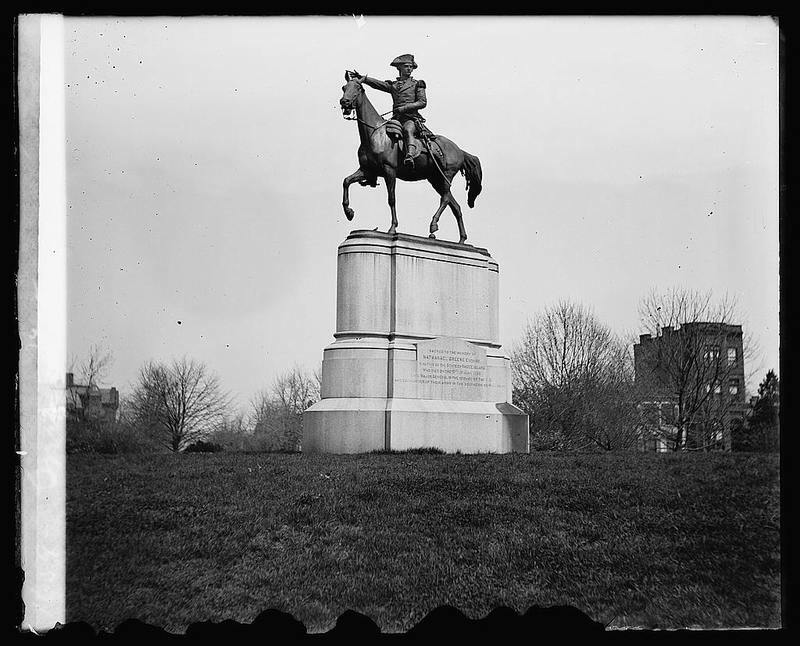 “Nathanael Greene Statue ,” DC Historic Sites, accessed April 24, 2019, https://historicsites.dcpreservation.org/items/show/265.